It has been over a year since Alain posted a list of new essays in Italian written by Andrea Vitali on the website of LeTarot Associazione Culturale, for which see http://www.forum.tarothistory.com/viewt ... 921#p19921. The last essay listed is "Invention of the Cross - 1633". Over the past year (and a few days) he has written many more. I want to list them, in Italian and English, with summaries, and give links to the Italian as well as to the Google Translate English version, which is often inaccurate but not worthless. Other search engines give different translations, which are not as good but sometimes get it right where Google doesn't. Summary: Here Andrea cites an epic poem set in the land of Circe, the sorceress who turned Ulysses' men to animals. One of them has "Torocco" as his last name. In life had been a loyal companion and also happy-go-lucky, one who was much disposed to laughter. He was turned into a dog and much enjoys that state, inviting Ulysses to do likewise and be his playmate. He argues with Ulysses about the relative advantages of being an animal or a human. He says that in the land of the Cyclops food grew in abundance; there was no need for all the sweat and tools back in Ithaca. Also, for prudence animals are better than men: just look at how the ant stores up for winter and the spider stores food in its web, taking just what it needs. Ulysses says it is just their nature to do these things, and human reasoning, by which alone free choice is possible, is far preferable. Tarocco is convinced and Ulysses is able to get him changed back to a man. For Andrea it is an example in which "tarocco" has the meaning of "Fool", meaning a person who doesn't think and just does what gives him pleasure. Where King, Pages, and Coins assist. From Point to Point there is a lot of difference. Summary: A treatise warning, among other things, Knights to stay away from card games, especially those involving pure luck, as opposed to the mixture of luck and skill, and then only for pure recreation, except when required by duty to a lord, and never to lend a friend money so as to allow a friend to continue playing, which helps neither the Knight nor the friend. The first tells the story of Joseph, chamberlain of Naples, who convinced the owners of a theatre, thus a house of the devil, to turn it into a home for orphans, a house of God. The second one is about a man attached to making money, who has constant worries and no time to rest, not even on Sundays. How much more pleasant it would be if his house were turned into a House of God rather than the House of the Devil that it is. The third, 19th century, reflects upon those who use the sermons on Sunday as an occasion for business and lascivious thoughts about the women there. He reminds us of how when Jesus entered the Temple of Jerusalem he saw there a house of robbers, and by driving out the money-changers testored it to being a House of God. it is the same when thieves turn the Church into a House of the Devil. The fourth is similar, but talks about the "bagatella" sins, the little sins that he assumes God will forgive and so has no need to stop doing. But this is hypocrisy and turns the House of God, in this case the human body and soul, into the House of the Devil. This is about the dangerous practice of the "game of the rest," in which people who have lost continue to play in hopes of winning back what they have lost, going "to the mountain", as it was called, staking what the do not have in hopes of getting back what they lost. They are encouraged to do this by the winners, who leave their winnings on the table, to suggest it is there for the taking. Andrea quotes from one personal story of someone who found himself losing sleep by counting and subtracting cards in his head. By considering the distraught faces of his opponent even if he won, he was able to quit and never gamble again. A certain sermon used the "game of the rest" to describe the creation of the universe and of the Virgin Mary, by analogy with a story by Pliny in which Mother Nature gives away the gifts of excellences to the various beings and finally plays for "the rest" and gives up the "gem of gems", a precious red jewel full of warmth and energy. The preacher uses this story to describe God's acts of creation, first the stars, then the moon and the sun, each timeputting on the table something worth much more than he did before. The impeccability of the angels is next, and finally, he gives "the rest" to create the Virgin Mary. This essay focuses on a satirical piece describing, as though prescribing, the life that a young person is supposed to learn to prepare for life, where "libertinism, corruption and licentiousness were considered as virtues." In the morning he has the tedious chore of deciding between chocolate and coffee. Then he is interrupted by the "inappropriate" requests of his workers for payment for the work they have done, French lessons, etc. At lunch with a lady and her bored husband, one participant remembers when the lady's beloved dog bit a servant, and the servant kicked the dog, for which she dismissed him after 20 years of loyal service. In the evening they go to a party where they have to be careful where they are seated, not to be next to inappropriate people. They play the card game with the "barbarous name", which has "heroes and heroines" (classical images) but mixes the sacred with the profane, and which requires "an intrepid spirit," but in fact is met with "random assaults." At the end Andrea gives a brief quotation from another satire inspired by Parini (whom apparently was an excellent player). I notice that anticipating the invitation to play tarocco is announced, an old person comments "that foolish game". This text, "The game of Cards or Folios", is a dialogue about "Spanish Triumphs," i.e. the version of triumphs, of Spanish origin, using the four regular suits, written in Latin by Juan Luis Vives, a friend of Erasmus. Andrea does not give the date it was published, but a work in English, which he footnotes, says it was published in 1538. It was later translated into Italian, and it is that plus the Latin that Andrea presents. Looking through it, I see no indication of what the rules might be. It is just banter. Unlike the Vives' text, this one says quite a bit about the actual conduct of the game. I can't tell if there is enough to reconstruct them; since the game is still played today in Spain, I suppose it is easy enough to get them by other means. What is also of interest is the type of banter that goes on among the players, in which they seem to enjoy making classical references. She [i.e. 'Human life '] is a Game of Tarot, where the whole World is light, and those painted have only that appearance, where the ox prevails with the Lion, Justice goes behind the nudes, Death takes the Magnates, the devil is discovered little, the Fool is always covered [protected? ], the fire is great when it rises: where the minor Tarots do not count: he who has the vertical star earns the favor; one who has the silvery moon in his hand does not have a dummy overhead [or, is not stupid in the head: he who has the rays of a golden Sun is not caught by the chill of the stripped; but eventually the game goes awry [a monte], and with a Trumpet orders the collection finished, and the retreat (3). From his description inherent in both the ludic and the symbolic aspects of the tarot, we find that the card of the World - where the four Evangelists in animal form are depicted, including Luke in the form of an Ox (4) - prevailed over the Strength card; that the card of Justice followed that of the Judgment, where for 'Nudes' the dead are to be understood, which in this state rose from their tombs; that Death killed the Magnates, i.e. the powerful; that the Devil was played as little as possible while the Fool played a very important role in the game; that the fire, or the Tower, when it was played, obtained a good score. The so-called minor arcana were worth little, since the trump cards were represented by the Triumphs, and still the one who owned the Star (5) could certainly expect a good conquest, and the same for those who possessed the silver moon, while those who held in their hand the Sun should not fear losing their clothes, with consequent icing. But then the game was canceled and with the Judgment card where an Angel was depicted playing the Trumpet (6) all the cards were collected and all went home. Matthew as a man, a symbol of Christ's incarnation. Luke as Bull, symbol of the supreme sacrifice of Christ. Mark as a lion, symbol of the resurrection of Christ (the Physiologus, a work redacted in Alexandrian Egypt, of probably Gnostic environment between the 2nd and 4th century a.d. by an unknown artist, shows that when a lioness gave birth to a dead infant, it was believed that after three days passed the father breathed on the face of the infant, restored it to life). John as an Eagle, symbol of Christ's Ascension. 5. The-vertical attribute given to this card probably refers to the Platonic concept of the astral origin of souls that are born on Earth. On this see the iconological essay The Star. Many, having gained by unjust actions, do nothing but put aside a nice bite (nest egg) for the Wolf, or for relatives. The houses are made with the money won at dice and are lost in the same way, but since the dice are scored (trucccati) and unstable, given that much depends on luck, the same houses are often lost. Someone stopped wearing ragged clothes to wear beautiful one, knowing how to handle the dice and cards: fattened their assets by winning the dice, they found economic tranquility saying go (a word used by the players to say: "I play, I see what the opponents have"), they assumed first-rate social roles by winning prizes (card games), they rose up playing bassetta (card game), they set up their finances with flusso (another card game), they triumphed with trionfetto (10), multiplied their belongings by playing forty (further card game) and playing tarocchi were no longer considered tarocchi, i.e. poor wretches (11). The last sentence, obviously, does not arise as a celebration of the game and its prerogatives to improve existence: on the contrary, it is an invitation to avoid it. The descriptive form is to be understood then more satirical, denoting the ability of the author to reach the target writing in a way opposite to what would be expected. He concludes, in fact, with these words: "The dice are like pills, because they make you evacuate, and purge the sac [burso, also meaning purse], but not the bile" (12). 11. On the meaning of the word tarocchi read the essays Tarocco sta per Matto and The meaning of the word Tarocco . Since this post is getting rather long, too, I will finish up later. This is a continuation of my previous post. I am only summarizing essays on his list after "L' "Inventione de la Croce" - 1633" plus others he has posted since August 13, 2018, per the list at http://www.letarot.it/news.aspx?id=4. There are also other essays posted in 2018 I haven't gotten to. Marchelli has a story that compares the game of Tarocchi to a fight among blind men, each of whom is convinced one of the others received a silver coin from a passer-by, who, however, merely pretended with words to have given it. Ricci imagines Tasso calling Ariosto a tarocco player who has "a flow behind," [un flusso dietro] which Andrea says was an expression for a way to lose in that game; it seems to be "appresso un matto scacca", i.e. followed by a checkmate ("matto scacca"); I wonder if that might be a pun on "crazy caca". Sarpi takes aim at some innovators in Venice who wanted to make trade inroads in the ports of the papal states, in conjunction with the Venetian Senate's insistence on bringing certain ecclesiastical crimes under their own jurisdiction. He compares them to a game of tarot: they "pretend that the Venetian Lords found their reasons on Privileges of Pope Alexander, & Emperor, and to destroy it out of purpose they changed their authority, and they mix it like they were those of the Parts [Parti} ( 8 ) of Tarocchi, which at the end are crazy [matto], and trifles [bagatelle] , and games of Hand." Andrea's footnote 8: - In other subsequent texts that mention this passage the word 'Parti' is replaced by 'Cards' [Carte]. Banchieri has a poem called "an invitation to go out and get some air", in which some young people play tarocchi among other games, then take a bath (probably in a river, Andrea says), and get drunk. Here Andrea quotes and paraphrases a long poem describing an imagined dream, in which the dreamer goes to an island in which, after passing through beautiful gardens, he enters a room and meets the "god of games", whose dress, "modeled on the oriental, was composed of multiform cards of Tarocchi, Cucù, Obre [Ombre?] and Tresette." There is much moralizing imagery about the evils of games. He eventually meets two doors, one labeled "Games of Commerce" and the other "Games of Chance." In the area with "games of commerce" he sees people playing "Tarocchi, Picchetto, Tresette, Reversino and Ombre." He sits down and plays a game of Ombre [we know from other essays that this is "Spanish Triumphs", known there as "Hombre," e.g. "Man".] He loses because despite having man good cards, his opponent had all the trumps ["trionfi"]. Then in another area people are playing chess. So it is the usual divisision between games of chance, games of mixed chance and skill, and games of chance, Andrea concludes. This is another work by Frugoni, for which he was forced to leave Genoa for Paris. It is the tale of Aurelia, daughter of Hugh Capet, king of France in the 10th century, revered for her sanctity, but also of Elfreda, evil wife of Edward King of England, who we are told, loved to play tarocchi, the "game of many beasts". Andrea supposes both the sympathy between her and beastliness and the idea that many of the pictures on the cards were of beasts, notably (I am quoting Andrea) } "the lion in Strength, the dog in the Fool, the eagle in the Empress and Emperor, the horses in the Chariot, the crab in the Moon and the figures in the form of an animal in the card of the World." Another expression occurring in Frugoni's narrative is that of "the group of the Hanged Man," meaning of of those who would be adventurous. Andrea begins, "Francesco Andreini (1548-1624) is remembered for having invented and interpreted the figure of Captain Spavento da Vall'Inferna, one of the most famous masks of the Genoese Carnival." He is a military man, proud, ambitious, and boastful." In the particular dialog of interest, the Captain plays the game of Primiero with Death, Time, and Fortune, which of course correspond to three tarot cards. Death wins the first game and wants to withdraw, for fear of losing what he won, but the others won't hear of it. He keeps winning, and the Captain keeps losing, until finally he draws his sword and cuts Death in half. Now, unfortunately, there are two Deaths: natural and violent. The Captain begs Death to aput himself back together. The esssay is also of interest for a few gaming terms used. I would add that this distinction between natural and violent death were later used by Paul Christian to distingulsh the Death card (natural death) from the Hanged Man (violent death). From an encyclopedic work, Andrea selects some sayings that Danti repeats about Fortune and Fate, in relation to other things such as riches, time, princes, glory, justice, and other subjects, some related to the tarot, for example, ":ightning bolts ruin the tall buildings, and leave the low houses alone." Since I have translated this one, there is no reason to summarize it. This one I have also translated. But the title is a bit misleading. It is actually about Dummett's account of a phrase in Maffei's description of tarocchi as "of new invention". Andrea explains why he finds Dummett's account unacceptable and offers the suggestion that tarocchi actually was a new invention at the time Maffei was writing, not the ludus triumphorum but a variation that involved a rule change, the result of which has come down to us as the game of tarot, but not what came before. This essay starts with a newspaper story about a bishop's proposed rules for priests, which leaves out mentioning the playing of tarot by name, instead prohibiting "card games" in general. The writer of the story, critical of clerics, thinks that is because the bishop does not want to prohibit tarot. Also the emphasis was on public playing of games, as opposed to private, which is not much of a prohibition. In passing the writer mentions that a priest once told him, jokingly, that if he had to choose whether to give up the Breviary or the tarot, he would choose to keep the tarot. The reference to concupiscence is that priests' concupiscence (lust) for the Bagatto was at least equal to the Pope's for the Emperor of Austria (the power then the biggest threat to Italian independence). Andrea then follows with other references to priests and tarot, on the one hand articles by ecclesiastical authorities sharply condemning priests' playing the game, especially seminarians who should confine their games to physical exercise and their minds to studying, and on the other hand numerous references to priests' love of playing tarot in the evening. This essay is about the playing of tarot in the military of c. 1550. First is a report that Andrea Dorea, the famous Italian admiral, spent all day in the gallera (bridge, galley?) of his flagship playing tarot, and then went ashore to the villa at night. The reason was that he was leaving an arrogant Spanish commander to his fate. He wanted to attack the Turkish pirates on his own, not under Dorea's command, so Doria let him do it, on land, but did not come to his aid when the campaign ran into trouble. Another example of tarot playing is an incident in the war between the Medici and Charles V on one side and the French and Estense on the other. Francesco d'Este (son of Alfonso d'Este and Lucrezia Borgia) was leading an army that had not been paid for 15 months. The result was that one of his soldiers was easily bribed to put a ladder covered with cloth next to the wall so that the enemy could come in. But the guards noticed it and prevented it. When the soldier was arrested, he was sitting in his tent playing tarot as though nothing had happened. 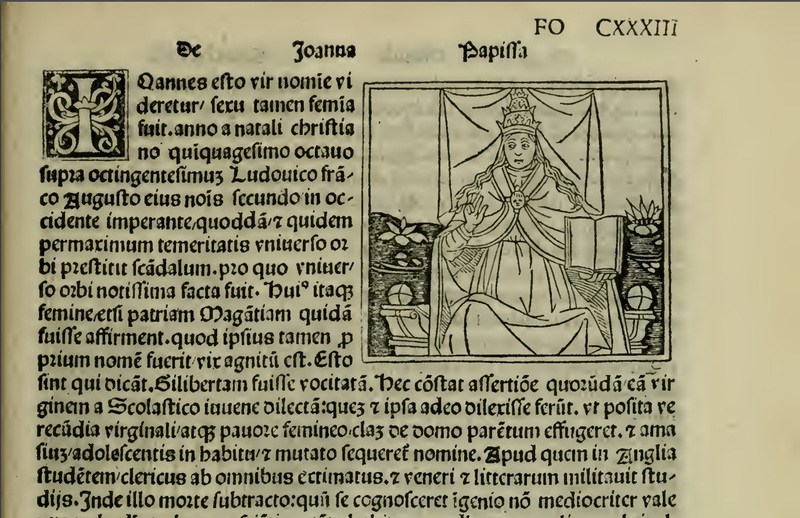 "Because there is the pope, there must also be the popess"
Here Andrea says that the "Pope Joan" legend was promoted by a book published in 1492 that had this story among those of other "famous and elect women" (I am pretty sure it is an edition of Boccaccio's On Famous Women, which was well known even at the beginning of the 15th century). He shows us an illustration from that book rather like that of the so-called "Marseille" tarot, which he says (without citation; I suppose he is thinking of the cards found in the Sforza Castle) was really designed in 16th century Milan and produced in Marseille after getting permission from the Milanese manufacturers. That the card referred to Pope Joan was believed by some, for example Aretino, as Andrea has shown in another essay. Already in the 17th and 18th centuries it was denounced as a malicious fable promoted by Protestants and "even believed on the other side of the Alps," as one 18th century poem puts it. He then quotes a paragraph from an 1849 account of the tarot subjects The avowed position is that the tarot subjects are perfectly orthodox, even the Popess, because the Bible says "male and female he made them," so if there is a pope there must be a popess. Andrea ends by saying today we know that the figure represents the faith, which is the first requirement in ascending the mystical ladder to a vision of God, as Aquinas affirmed. I have reached the end of the list, but there are two more written since Aug. 13, 2018 but placed earlier in the list. This essay discusses "bagattino" as the word for the smallest denomination of Venetian currency, documented to 1478, but probably in effect since 1300, according to a 1786 study by Guid’Antonio Zanetti. It was of wide diffusion, seen also in Verona and Brescia. The coin existed before then, but was called the "Denaro piccolo". It also was used in Tuscany, Andrea cites Boccaccio's Decameron, c 1375, 8th day, 9th story. It is also n the Malmantile Racquistato by Lorenzo Lippi (died 1664), in the course of describing a Minchiate game. It also appears in Morgante Maggiore, by another Florentine, Luigi Pulci (1432-1484). It also appears in La Cofaneria, a work by Francesco d'Ambra (Florence 1499 - Rome, 1558), as well as his Banchetto de 'mal cibati. Andrea cites the passages in question. This essay goes through each of the cards as explained in the Sermones de Ludo by the anonymous preacher in the late 15th or early 16th century. Even though the preacher is against this game, Andrea cites one 16th century religious figure who defended it, Piere Gregoire, who said ""Card games were invented, in which, while being played as a game, traces of a certain erudition also appear, as in the Tarot." There is also the example of Piscina's 1565 Discorso. Andrea starts by explaining the sacredness of the number 22 in several traditions. Then he goes through the cards one by one and explains the religious significance as would have been seen at that time. At the end he gives examples of other religious games. Google Translate does a fairly good job here, as the language is not archaic. The addition focuses on the comments of the editor/censor, who displays his misogyny in the course of defending his censorship. What Andrea also finds of interest is his use of the phrase "argumento in Tarocco", which he interprets as meaning "argument about false things", things in the mind, necessary to discuss to make the truth known. So "Tarocco" means means "foolish" just as false gold is "fool's gold", he says. In the Serenissima and in Trentino, between "Witches" and "Diabolical Priests"
Gérard van Rijnberk also noted it in 1947, with another illustration that has not been traced. Prof. Andrea Vitali, President of Le Tarot Association, of which I am a scientific consultant, has recently added many historical essays on tarot. Currently there are 154 essays present in Italian of which 84 translated into English by Dr Michael S. Howard. Vitali then expanded and updated his iconological essays. Among other things, Vitali has brought numerous examples of the meaning of the word tarot as fool. Of extreme interest, among many, the sage ‘El bagatella which is the symbol of sin’ where the reason for the presence of the Bagatto in the order of the Triumphs is historically explained. See the essays section at www.letarot.it. Thanks for the statistics, Alain. I still have quite a bit of work ahead of me. The work of interest is an allegorical play performed for Carnival in 1605 in which the characters represent various parts and passions of the souls of young men. In the fifth act Spinello, representing the concupiscible part, is reading a letter sent from a character named Tartaglia to his friendMortello, servant of Signor Valentino, incarnation of the irascible part. Tartaglia tells Mortello he will bring him from Morroco a “tarocco painted in the face in the manner of a Mattacino,” that is, a jester. Andrea argues that such a gift would be too commonplace in Italy at that time to be meant seriously as a gift, much less from Marocco, a country chosen only because of the rhyme with “tarocco”. In fact Tartaglia, who has earlier spoken of drinking “minchione” tea (a word for “fool” etc.) is insinuating that he himself (or perhaps Mortello, I am not sure) is the gift, hence also the jester or buffoon. Andrea draws the conclusion that the word “tarocco” itself does not mean simply “tarot card” but in fact again “fool,” as in many other cases he has found, so that Tartaglia is saying he will bring his friend a fool in the manner of a jester. This is another essay in which the word "tarocco" appears, this time clearly with reference to the game, because of the reference to the Sun, Moon, and World, three powerful cards. The context is a long speech by a buffoon, that is, a stock comic character, who condemns the practice of giving rich gifts so as to procure favors. Those who have, get more. Those who have not, get less. I Whoever does not have the king of Coins is considered as the Knave of Cups – a poor loser, Andrea says. And "anyone who does not have the Sun, the Moon, and the World in their hands remains a tarocco" - the Crazy One (Matto) of the Tarot, i.e. a fool, Andrea says. Personally I do not see why "Fool" is indicated. I would think "non-entity, someone of no importance" is what is meant. It is not this person's thinking or moral character that is being judged, but his or her power or status, which is dependent on money.